Coding and "The Second Grade Arcade"
Welcome to the Second Grade Arcade--the culmination of an exciting robotics engineering unit on coding for our second graders. 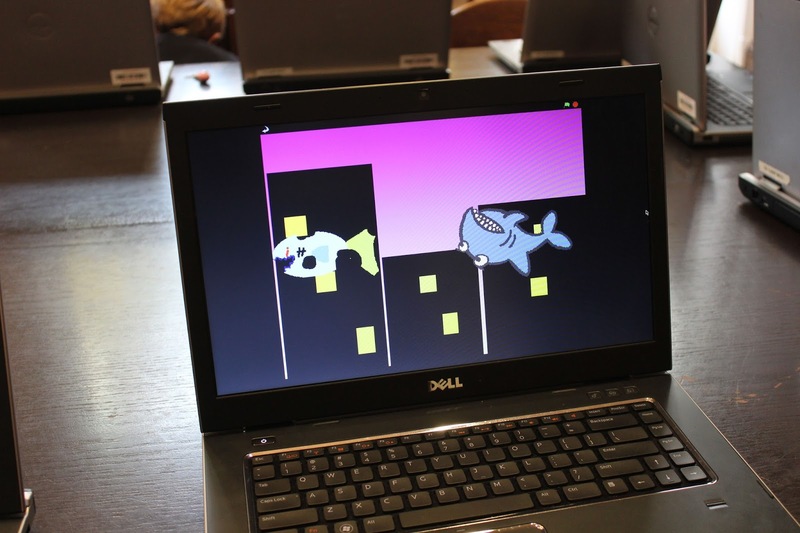 This fall, the boys have been learning a developmentally appropriate visual programming language called Scratch, developed for young learners by researchers at MIT. The program enabled them to build games by arranging and combining commands and controls to make their animated characters, called Sprites, move and interact. 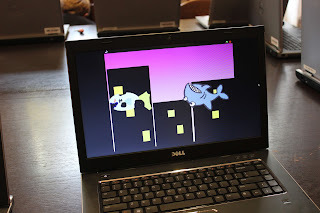 The boys learned the logical thinking behind programming while having a great time building their games. The animated end products were creative, colorful, and cute. Yesterday, while at the "Arcade," they had the chance to play each others' games and explore the logic behind their classmates' creations. In the clip below, a boy demonstrates a fellow second grader's project. 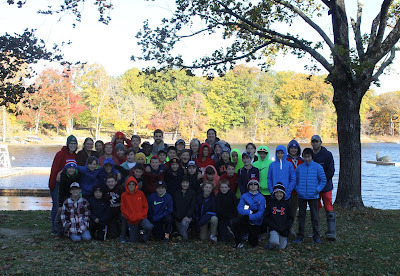 Our sixth graders had a wonderful experience last week at Camp Ramapo where, over two days, they met a series of outdoor challenges in a beautiful setting. 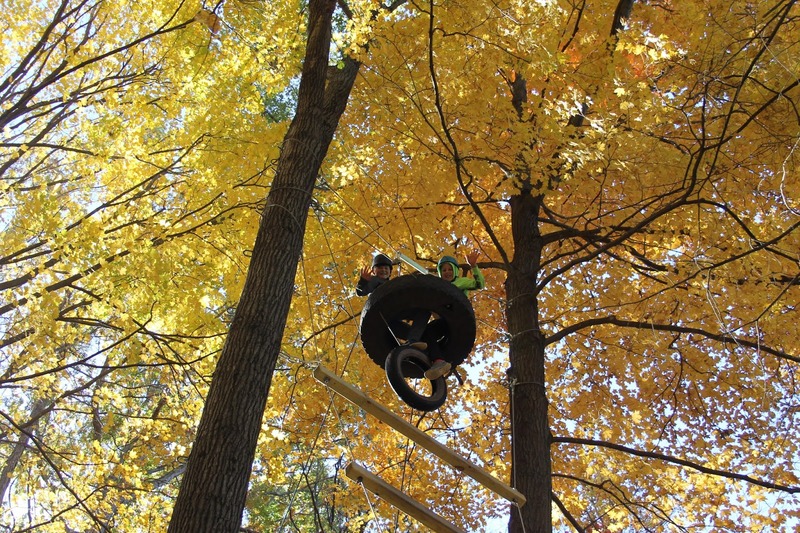 Low ropes, high ropes, survival challenges, and hikes through the woods. You name it, the boys were there to encourage each other to reach new heights. Team work and trust were the keys to success. During a day in the woods, each group successfully problem solved to create a shelter and boil water. On the high ropes course they depended upon a belay system connected to their friends and teachers who supported, encouraged, and protected them during their climb. In the tire challenge, they collaborated with each other to reach the top of a vertical play pen. Then, when evening arrived, they hiked and enjoyed S'Mores and stories by the campfire. Two days spent in the woods taught so many lessons in tangible ways: that each boy has different and important strengths to contribute to a given task; that facing a fear and overcoming it builds confidence; that teamwork, trust, and encouragement are essential for success. Today our Sixth Grade boys left for a two day overnight trip to Ramapo for high and low ropes outdoor leadership and team building experiences. 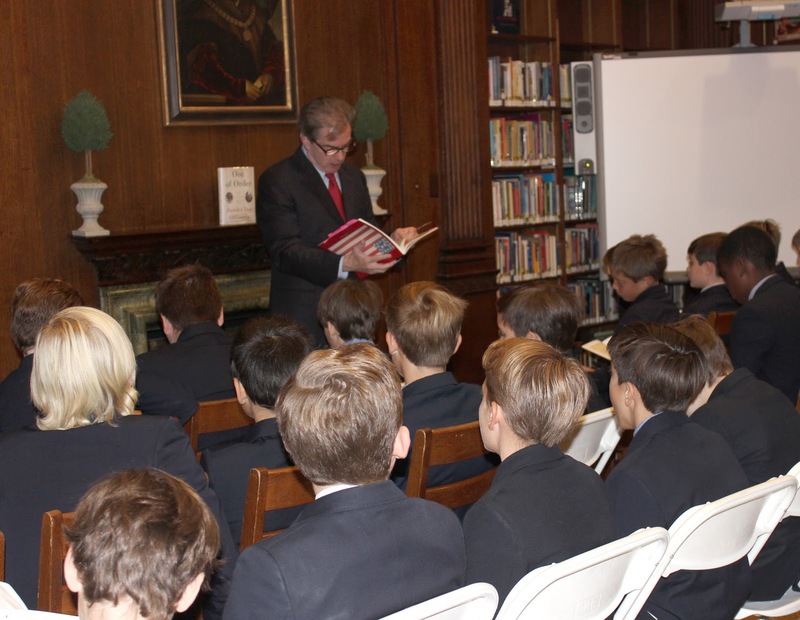 Our Seventh Grade boys return tomorrow from a week-long experience in marine biology and ecology on the Cape and last week, Second Grade boys had their first in a series of sessions with an educator from the New-York Historical Society. The boys are learning about life in early New York City. For the next couple of weeks, their teachers and the N-YHS expert will lead them in hands-on learning activities related to the Lenape tribe of early Manhattan--or Mannahatta--"the land of many hills." In the first session, they were given samples of Lenape artifacts and then worked together in small groups to try to determine their artifact's purpose through careful examination and observation. Guided by their teachers and the N-YHS educator, the boys are now creating seasonal models of Lenape communities complete with longhouses and wigwams. Educators and curators from the N-YHS will continue to visit the boys' classrooms at specific times throughout the year, and the boys will be making special planned visits to the Society. Through our partnership with the N-YHS--now in its fifth year--the boys benefit from having access to artifacts from the museum's collection and the expertise of an expert in the field. Saint David's also partners with N-YHS for a First Grade unit on mapping, in which the boys study the historical maps of New York City and explore how to create a map using the techniques of cartographers. Learning out of the classroom is as important as learning inside the classroom. Saint David's boys are out and about. The Class of 2017 and their teachers are on Cape Cod, where they are spending this week in rich interdisciplinary study of marine ecology. During these days, the boys will explore the marine environment, participate in observational drawing sessions, and engage in a STEAM project in which they construct a critter, using what they have learned about the environment, adaptation, evolution, art, and design. Introduced two years ago, the critter project is a big hit with the boys, who eagerly rise to its creative design, mathematical, and scientific challenges. A decades' long tradition at Saint David's, the Cape Cod trip is ever evolving in alignment with our program of studies. 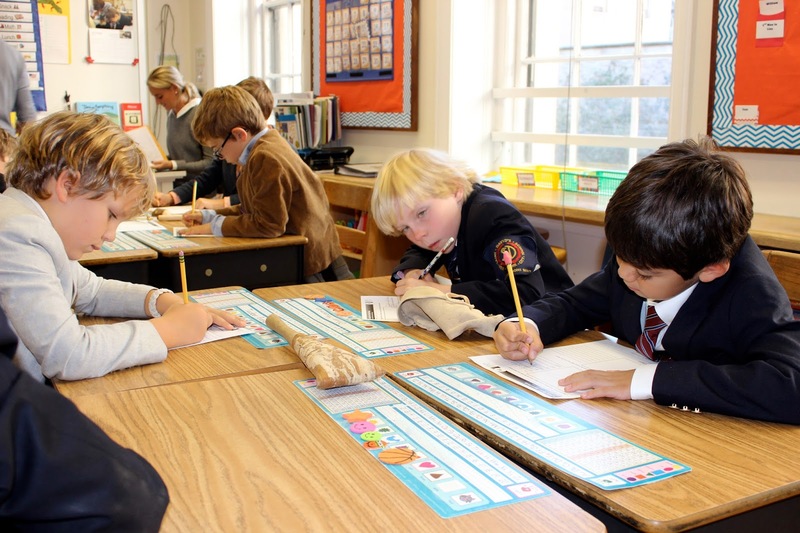 Just as important is the opportunity it affords our seventh graders to expand and deepen friendships, so vital to the emotional development of boys. 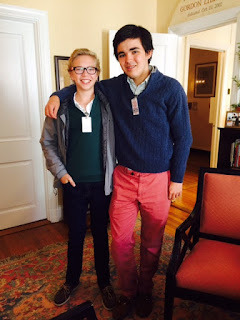 Oliver and Mac, both '15 dropped by to say hello. Hailing from Hotchkiss and Millbrook respectively, they are enjoying the last day of parents' weekend by visiting alma mater. It was so fun to see them and catch up. A first draft of the Constitution compared with the final...Frederick Douglass's letter to his former master...the Thirteenth Amendment abolishing slavery. These were some of the documents that our sixth graders analyzed this morning as James Basker, President of the Gilder Lehrman Institute of American History, led a workshop for the boys and their parents in the Hume Library on "Why Documents Matter.'" Today the boys got a taste of what they will experience when they and their teachers visit the actual GLI vault at the New-York Historical Society that houses the original documents. 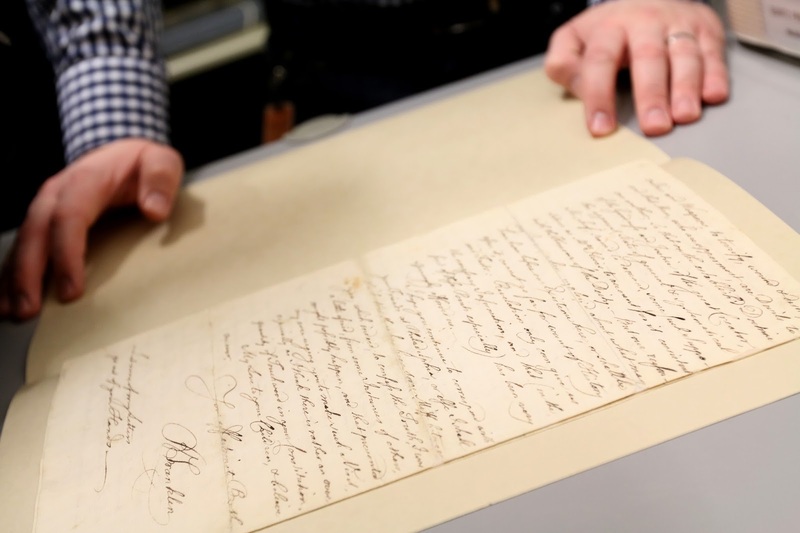 This is the third year of our school's partnership with this prestigious institution, which through the Gilder Lehrman Collection holds a vast archive of more than 60,000 primary source documents and artifacts. 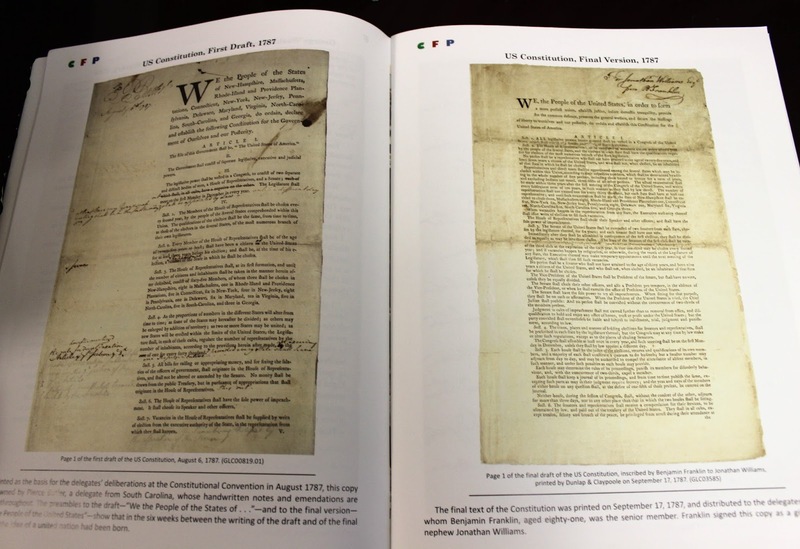 First draft of the US Constitution (Aug. 1787), left; final version (Sept. 1787), right. 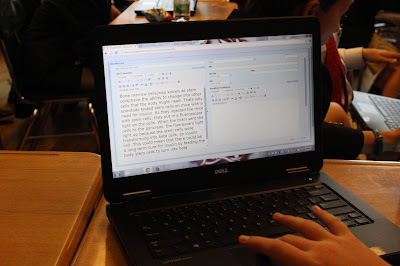 In today's session boys learned that having access to original documents, complete with scratch-out edits, enables a researcher to look beyond the words to the strategy, thinking process and emotions of the writer. For example, when comparing a first draft of the Constitution with the final version, boys could see how the writers changed from identifying themselves as representatives of individual states to "We the People of the United States," marking, as Professor Basker noted, "a magic moment" in our nation's history. When the boys saw that Frederick Douglass, in writing to his former master, declared, "I love you, but hate Slavery," they got a glimpse into the heart of this leading abolitionist. And, they proposed that the 16th President signed the Thirteenth Amendment as "Abraham Lincoln" rather than with his customary "A. Lincoln," to underscore both the significance of the Amendment and his support of it. The boys will visit the GLI Collection as part of their study of American History, in a course that emphasizes the value of documentary evidence in its original context. There, they will learn via interaction, exploration, and engagement with the "real thing." Deliberate moral introspection is our school's theme for this year and our collaboration with Gilder Lehrman provides our boys with the opportunity to deliberately analyze an original source document from multiple angles and perspectives, parsing it for the clues offered and the truths, often moral, it may point to. Boys love to discover. This is learning at its best. 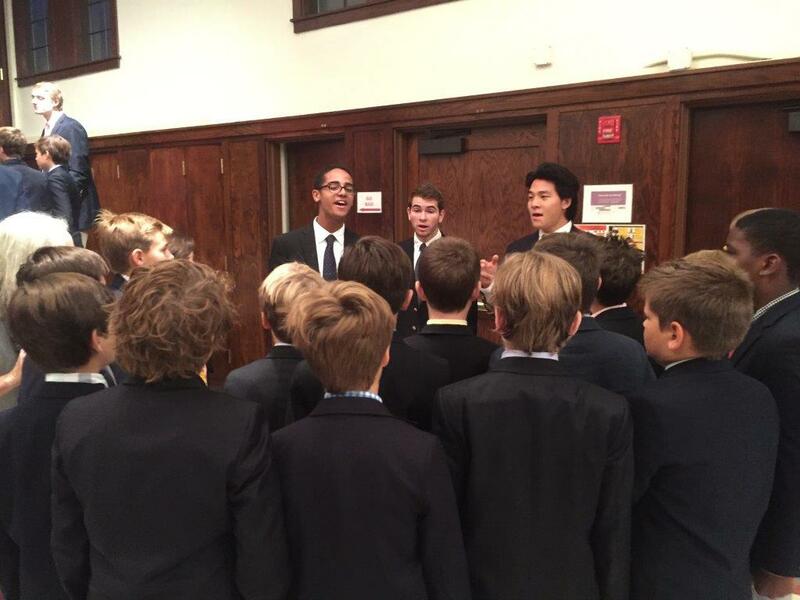 On Friday morning, the Baker's Dozen, an a cappella singing group from Yale University, visited Saint David's. The group engaged our Chamber Singers in a Master Class that included several new vocal warm-ups and also discussed their interest in singing with the boys. Afterward, they separated into four vocal groups--soprano, alto, tenor, and bass--and taught the boys a song in four-part harmony (see video clip, below). The performance for the Upper School was fantastic, and included a rendition of "Hey Bulldog" with fourth grader Casimir M. in a featured role. The Baker's Dozen visit was a sweet treat for us at Saint David's, and a great start to the day. 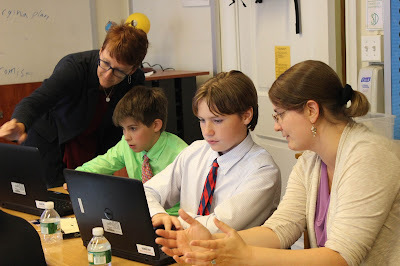 Our sixth grade boys have been honing their research skills in a new technology-based interdisciplinary studies class that is team-taught by teachers Karen Davis (English), Emily Einhorn (science), Joe Shapiro (history), and Gwen Kaplan (library). The class is loosely based on the educational idea of “20% Time,” which promotes students selecting a topic in their own area of interest to research while still hitting all core skills and content. After choosing a subject they are interested in or passionate about to study--as it relates to their English, history, and science classes--our boys then research their question or topic using selected databases-- gathering information, creating citations, and compiling their findings--with Noodletools. The wide range of topics selected by the boys have included how climate change is affecting Snow Leopards, bone marrow stem cells, pirate lore, and the Battle of Bunker Hill. At the end of the trimester each boy presents the results of his research using iPad technology. 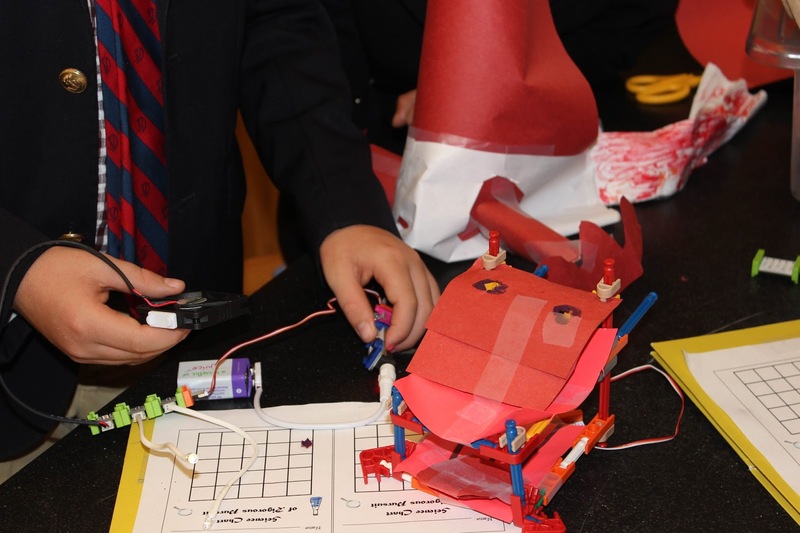 This unit is an example of the purposeful integration of technology and the interdisciplinary focus of our Upper School program, where boys make connections across disciplines and develop a deeper level of understanding. The following article by Lower School Mathematics Coordinator Jennifer Horton appears in the summer 2015 issue of Saint David's Magazine. This fall in math and science classes, second graders learned about the European Space Agency’s success with the Rosetta spacecraft and its 220-pound lander, Philae, which harpooned itself to the surface of a comet in November, allowing for the first extended close examination of a comet. Designed to operate through 2015, Rosetta and Philae will make observations as the comet makes its nearest approach to the sun six months from now, at 115 million miles, still outside of the orbit of Earth. 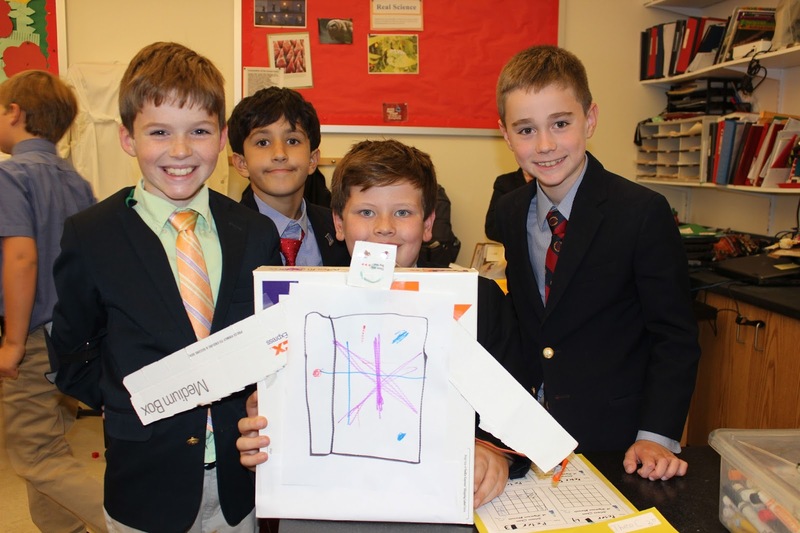 “Invited by NASA,” boys were assigned a mission: design a prototype lander which can successfully land on, and explore, a comet. Students were tasked with building a second generation lander, Philae II, which would explore a different undiscovered comet. 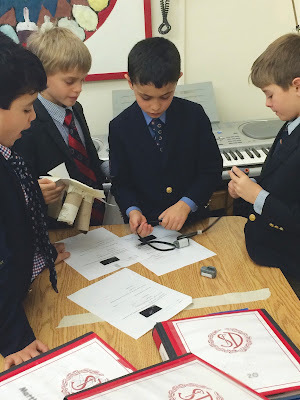 Working together in teams, the boys had free rein to come up with ideas about how to build successful probes using the following items: paper towel rolls, masking tape, measuring tape, and card stock paper. There were several guidelines each team had to follow due to the terrain of the comet. In order to be successful, each lander needed to be no larger than a piece of paper, had to have at least three legs and be able to attach to, or stand on the comet. 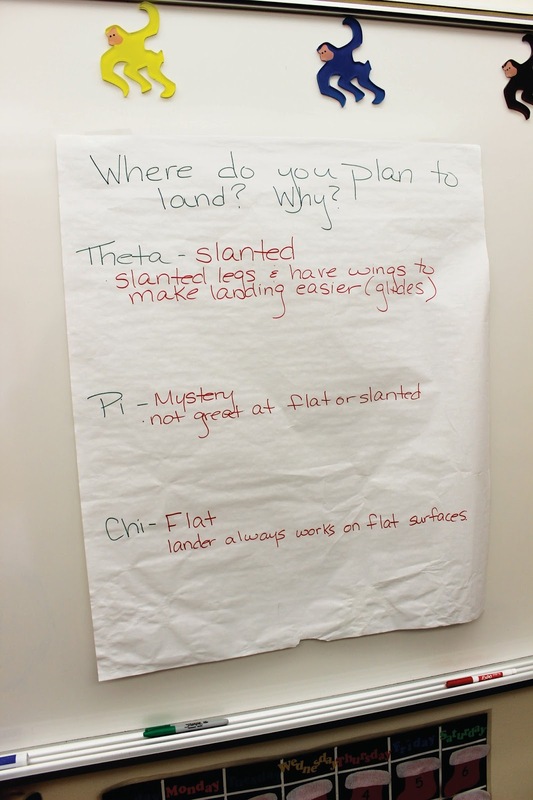 The unit was launched with the essential question, “How can you build Philae II to successfully land on and explore a comet?” This large challenge was broken down into smaller, manageable tasks by presenting different tiers of questions. The smaller tasks were directly related to project goals and provided guidance to keep students on track. During the first phase of this challenge, each student engineer received measurements for their probe’s legs in inches that they had to convert into centimeters. Next, students used their metric measurement to match up with their engineering team. Once teams were formed, students learned about the three regions of the comet. The first region was flat and wide. This was an easy spot to land, but was not very interesting geologically to scientists. In addition, this region was in proximity to a mountain range, which could inhibit the solar-powered sensors on the Philae II. The second region was extremely rocky and on an exaggerated slant. There were very unusual geological features in this region that NASA scientists were very interested in exploring. This region was in direct sunlight, which would allow the solar-powered sensors to work for an extended period of time. The third and final region was highly interesting to scientists, yet completely unknown (known as the mystery surface). The final step in phase one of the challenge was to decide which region of the comet Philae II would land on, explain why that was a region of interest, and create a design plan for the lander. “When we make thinking visible, we get not only a window into what students understand, but also how they are understanding it. 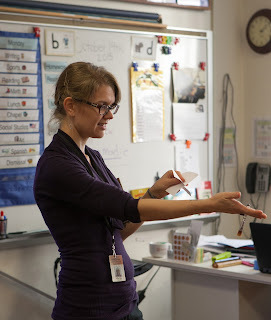 Uncovering students’ thinking gives us evidence of students’ insights as well as their misconceptions.” (2) Asking students to make a plan and support their plan with evidence of why is a way to gain insight on student understanding. The second phase of the project was the actual building and testing of the various landers. Each team had several opportunities to test their prototype on a practice comet, based on the three known regions. Continuing conversations in both science and math classes, students encountered the same concepts in multiple ways; thus helping them develop a depth of understanding and demonstrate true knowledge transfer. 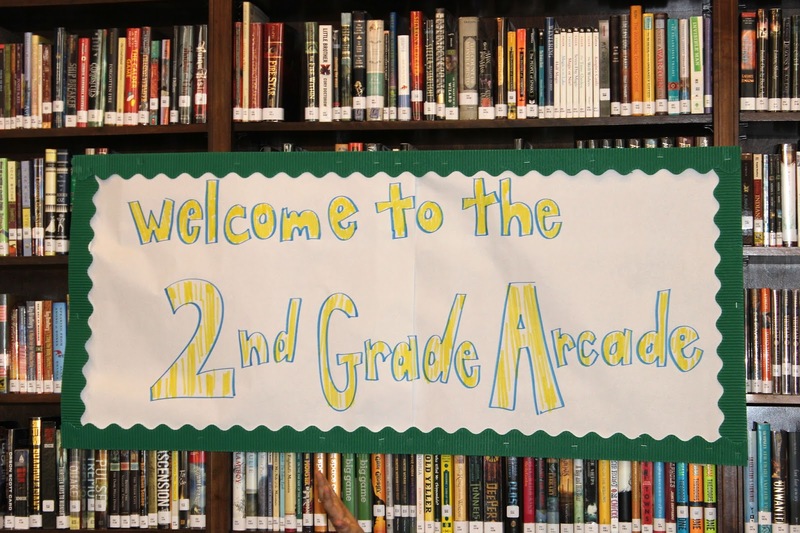 By inviting students on this mission, they became the center of the learning process. Students were empowered to make decisions and apply prior learning experiences to the culminating project, the Philae II. This mission was designed with important specific learning objectives in mind, while also accomplishing core learning objectives as well. In math class, students completed units on measurement, time, and graphing. 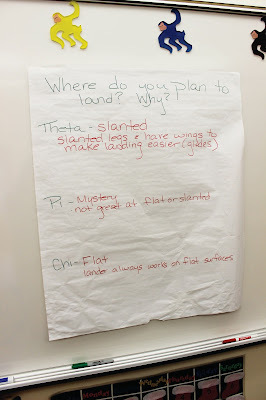 This mission allowed boys to understand how all three topics can relate to real-world happenings. Boys needed to measure lengths, use appropriate tools strategically, classify events according to duration of time, and be precise when making calculations. 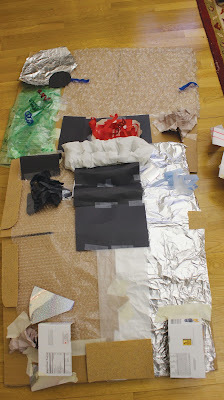 They also focused on an engineering project: to build an actual comet probe and test their final project. In science the boys first gained background knowledge of the Rosetta mission and the Philae lander. Students learned how scientists and engineers work together, how engineers work to solve problems, and what components help objects fly and land softly. They also came to realize that engineering design is an iterative process, involving repeated rounds of analysis and testing. 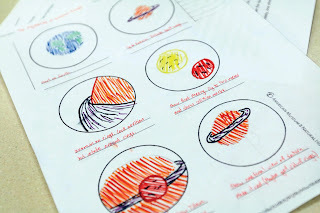 Boys were then asked to reflect, through writing and/or drawing, on one of two response questions: What is something you still wonder about the Philae comet lander? What sensor would you attach to the Philae comet lander? 1 Vasquez, Jo Anne. STEM Lesson Essentials, Grades 3-8: Integrating Science, Technology, Engineering, and Mathematics. Portsmouth, NH: Heinemann, 2013. Print. 2 Ritchhart, Ron, Mark Church, and Karin Morrison. Making Thinking Visible: How to Promote Engagement, Understanding, and Independence for All Learners. San Francisco, CA: Jossey-Bass, 2011. Print. 3, 4 “Resources | Next Generation Science Standards.” Resources | Next Generation Science Standards. Web. 31 May 2015. 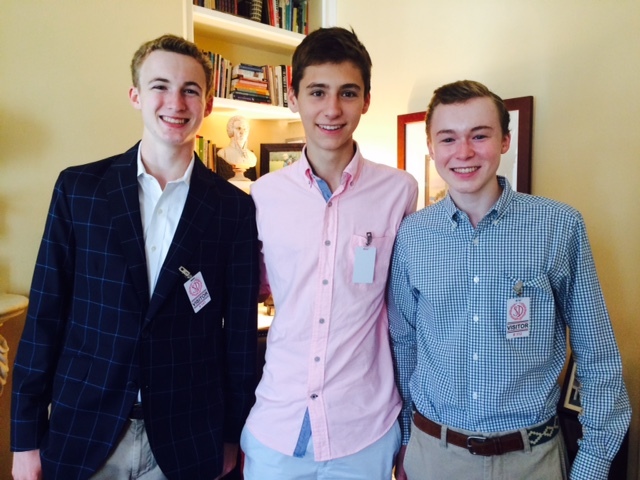 Several alums have returned to visit old friends and teachers over the last few weeks. It's so much fun to catch up with them and hear their stories. 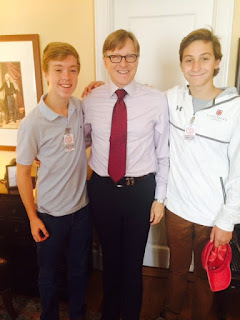 Connor '13 (Bronxville), George '13 (Riverdale) and Thomas (Riverdale) '13 dropped by last week, and today Danny '15 (Trinity) and Oliver '15 (St. Georges). They are all enjoying high school and the new independence it affords. Yesterday's White and Red team matches against St. Bernard's in the North Meadow of New York's famed Central Park were a spectacle to behold. Both matches were highly competitive, with our boys exhibiting impressive skills. White's game ended in a 1-1 tie with one of the highlights being the impenetrable back line. St. Bernard's keep pounding away at the White defense, but it held strong. 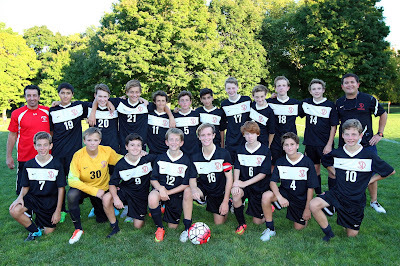 For Red, the game ended in a 3-1 score in St. Bernard's favor. Here, the aggressive front line repeatedly penetrated the St. B's defense throughout the game, pushing right up to the goal on numerous occasions. The ball just wouldn't go in. 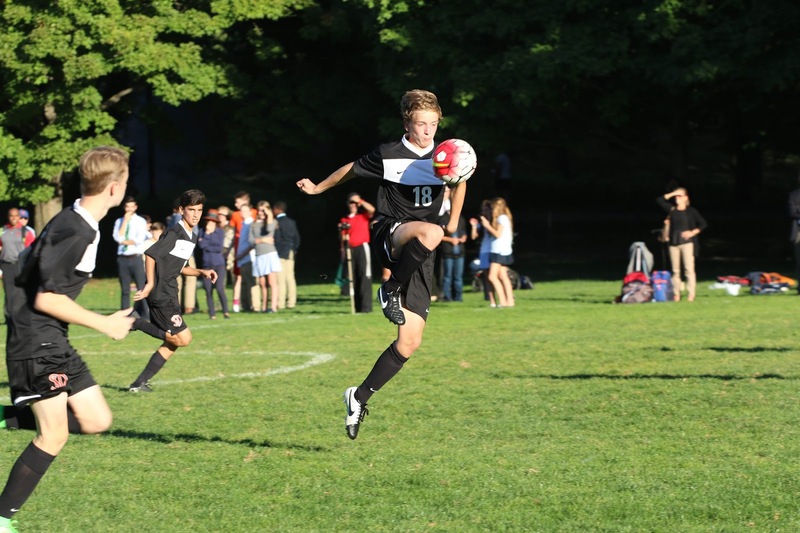 The slope of the field, against us in the second half, also provided St. B's a slight advantage. Pushing upgrade, especially in the second part of a game is never fun! The boys fought hard though, never losing hope. It was impressive soccer. I was proud of the way Saint David's boys, guided by their expert coaches, handled themselves on the field, always taking to heart our focus on honoring the game and exhibiting good sportsmanship, in addition to displaying impressive skills. 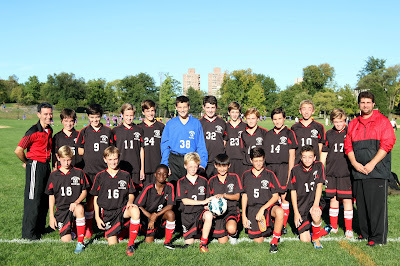 Unfortunately, due to unexplained circumstances, Charles Osgood, long time supporter of Saint David's, never arrived at the North Meadow, although two fifth grade boys swore to me they noticed a distinguished gentleman by the Saint David's goal in the dying minutes of the Red game. When I looked up, the shadow created by a small hillock interrupting the setting sun to our west, made the figure incredibly difficult to identify. It could have been anyone. At the final whistle, a second glance toward the goal resulted in my seeing nothing--no shadowy figure, no distinguished gentleman. Was it Osgood? That I cannot say, but your Cup, Mr. Osgood, remains upside down! Until we try again .... next year! The following overview by Science Chair Nora Sundar appeared in the article Digital Universe: A Groundbreaking Partnership Takes Flight in the summer 2015 issue of Saint David's Magazine. Is there life on other planets? How many stars are out there? What does it mean that the universe is expanding? Throughout human history, we have gazed into the sky asking questions, looking for patterns, struggling to understand what we see and what it means. 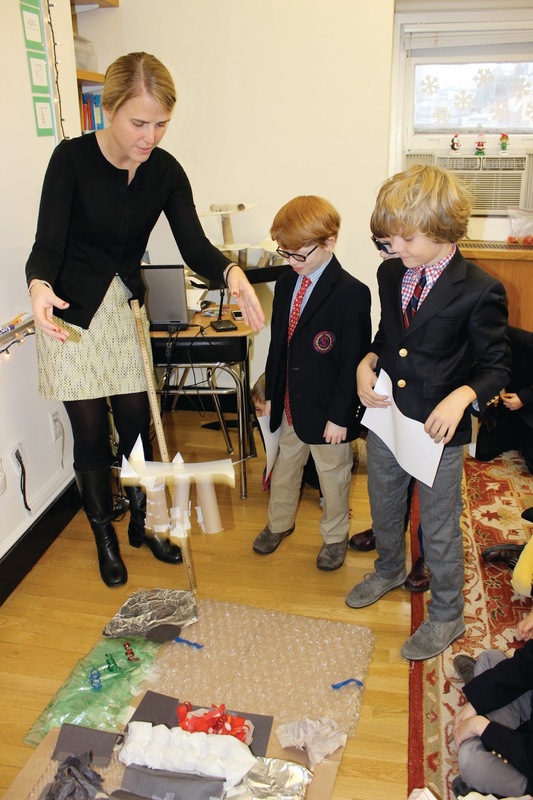 During the winter, the “Digital Universe” unit, a first-of-its-kind partnership between Saint David’s and the American Museum of Natural History, invited Sixth Grade boys to pose and investigate their own questions about the cosmos. 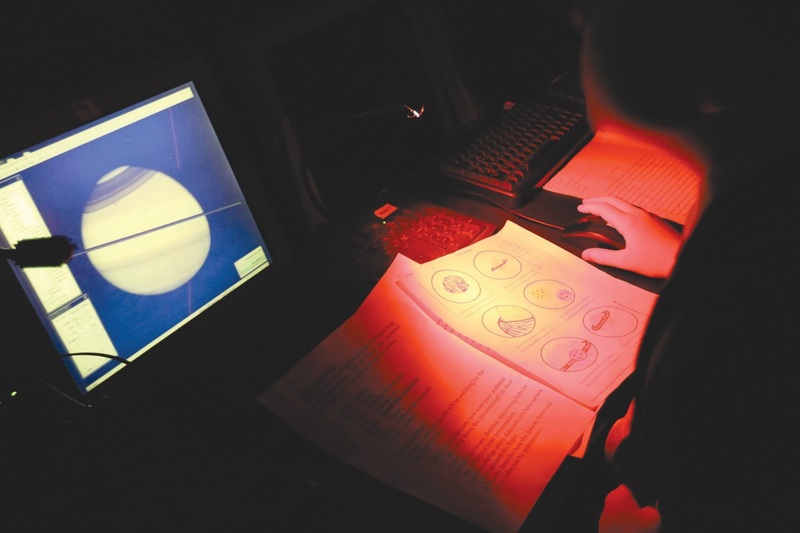 The partnership fits into the sixth graders’ study of astronomy during the winter term in science. 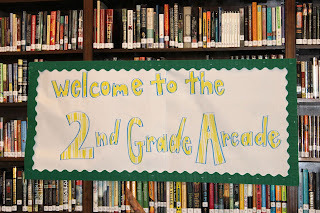 This was the first time that the AMNH partnered with a school for the program. 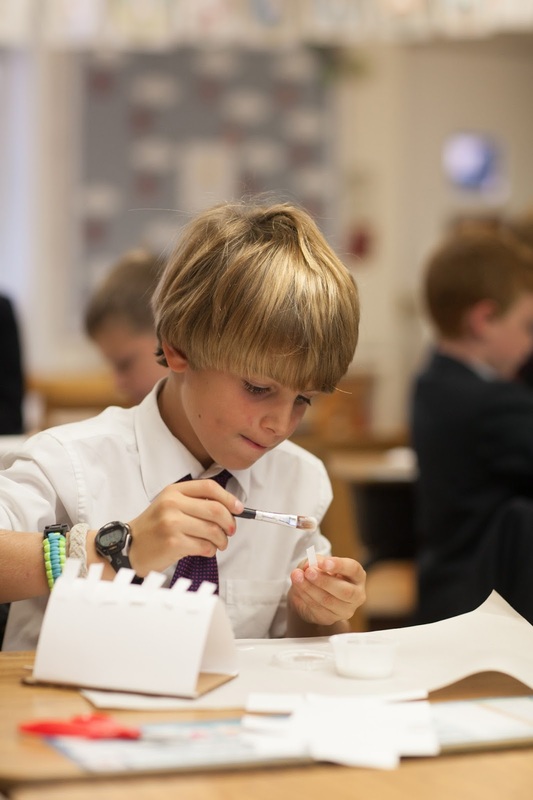 The partnership allowed boys access to the research-grade tools and deep discipline expertise of the museum’s educators and astronomers, combined with Saint David’s teachers’ ability to create active, engaging learning experiences informed by best practices for teaching boys. Over the course of four extended field-study visits to the museum during the winter term, our sixth graders investigated the cosmos using UniView, the front-end software that interfaces with the Digital Universe Atlas: a vast aggregation of astronomical data captured through advanced telescopes by dozens of organizations across the globe and represented in virtual 3D. Students learned to use the digital tools to virtually “fly through” the universe. Working in pairs, boys posed research questions of particular interest. Where can we find evidence of the Big Bang? What astronomical conditions allow Earth to support life? Are there similar planets that might also support life? During field study visits, and in science and English classes back at Saint David’s, boys built arguments from evidence found using the Digital Universe Atlas, museum exhibitions, and online databases and journals available through the Saint David’s library. 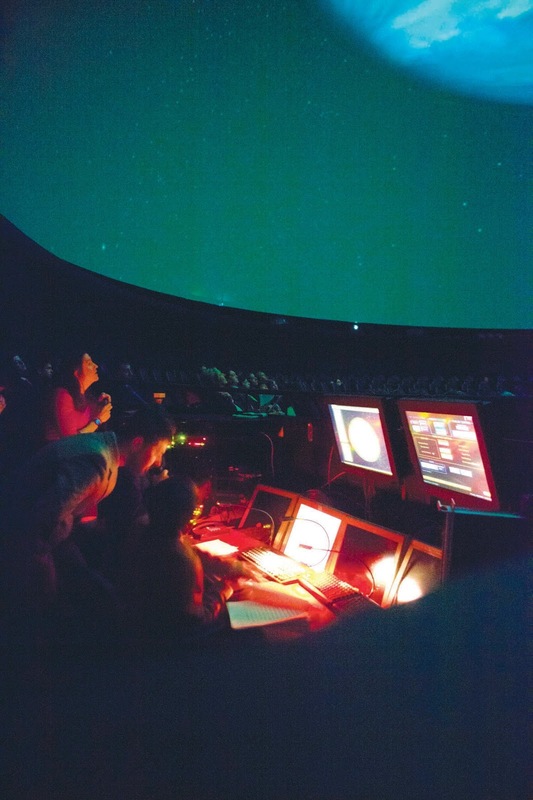 With support from English teacher, Karen Davis, and guidance from museum astrovisualization experts, boys translated their research findings into a gripping narrative paired with cutting-edge multimedia visuals, in the form of a planetarium show. Finally, in March, in front of an audience of classmates, faculty and parents, the boys took turns climbing down into the control booth of the Hayden Planetarium and performing their shows, live, using the same sophisticated tools used by planetarium professionals. The boys took us on flights around our solar system and beyond, through galaxies, and out to the edge of the observable universe, billions of light years from Earth. Along the way, as they treated us to breathtaking images of planets and moons, they told us stories that wove together salient information about their topics. They answered their questions and posed new ones, inspired by their in-depth study of the universe. 1. Tyson, Neil DeGrasse. “Beyond the Big Bang.” The Universe. The History Channel. New York, NY, 4 Sept. 2007. Television. Robert the Robot with eyes that light up and an arm that moves, a fire-breathing dragon, an electronic piano that soon may play a tune. 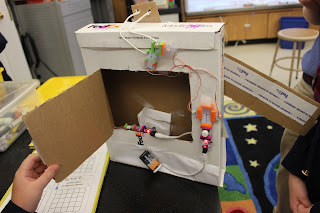 Our third graders are having a blast designing and building these and other of their own original creations with littleBits electronics. The boys are using the electronics pieces to make circuits that combine input pieces with output pieces. They work in teams in a process focused on the trial and error strategy for problem solving; this is how they figure out the best way to assemble parts to successfully create a circuit and learn the importance of proper sequencing. Asked what challenges they encountered along the way, their answers included "when the fan broke," "building the actual body," and "having to keep trying over and over." But it's precisely these struggles that lead to light bulb moments of understanding on the road to success, and excited exclamations like "Mr. Donnelly, Mr. Donnelly, look! I made the light sensor work!" In the clip below, boys who created "Robert" share why they selected a 'robot' for their project.